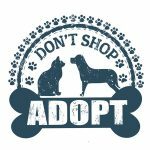 Check out our Australian Cattle Dog Adoption Listings! Gutsy and smart, the Australian Cattle Dog, with its unusual speckled or mottled coat, is a breed with many devotees. The breed originated in the 19th century when collies were crossed with dingoes to create a quiet and willing cattle-herding dog. In 1840, Queensland resident George Elliot began experimenting with crossing the native Dingo with Scottish blue merle Collie dogs, in hopes of breeding a skillful herding dog that was better-suited to the Australian terrain and environment. The resulting puppies, called the Hall’s Heelers, quickly gained the notice of local cattle men and were purchased as working dogs, where they gained recognition for their natural herding skills. To date, it is the Australian Cattle Dog who is given credit for the booming beef trade in Australia; this unique and skillful dog providing ranchers the ability to handle large herds of cattle on open terrain. Two brothers, Jack and Harry Bagurst, decided to try and improve upon the breed even further and, in an attempt to make them more compatible with horses, introduced the horse-loving Dalmation to the bloodline. This produced the desired results, though a great deal of the original type was lost with the cross. Determined to maintain the dingo-like body style, they then crossed the speckled puppies to the black-and-tan Kelpie, another breed that was known for his herding abilities and rugged body style. It would be these two crosses that would not only create the desired dingo-like body type, but would also produce the characteristic black masking and uniquely speckled coat that the Australian Cattle Dog possesses today. The Australian Cattle Dog, not to be confused with the Australian Shepherd, is a unique breed, bearing a strong resemblance to their wild cousins, the Dingo. They are a hardy-looking breed, ideally suited for life in the bush and their dark eyes sparkle with a keen intelligence. The Australian Cattle dog stands an average of 17-20 inches high at the shoulder and is a lithely muscular canine with an average of about 30-50 pounds at adulthood. 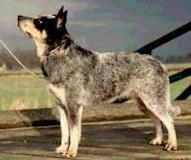 The Queensland Heeler, as he is often known as in his home country, is a uniquely-colored dog, easily recognized by his prominently masked face and his coarse coat of mingled speckle and roaned hairs. They only come in two color varieties – the blue and the red, though the blue variety is most common. The Australian Cattle Dog was bred specifically as a working breed and, as if he knew this, it seems that most of these dogs take their jobs very seriously. Very dedicated to their work and very athletic, the Australian Cattle Dog has a keen eye for detail and a strong tendency to ‘work’ when they aren’t even on the job. 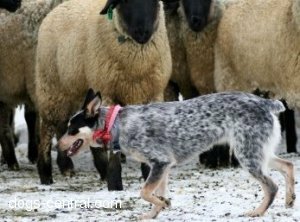 Herding other pets and people seem to be a natural past-time and it’s not uncommon for a Blue Heeler to start herding the kids around where he thinks they belong. While very loyal to his owner, the Australian Cattle Dog is often very wary of other people and this wariness can give room to skittishness or the tendency to nip. Judging strongly frowns upon this and any show dog of this breed must display a good even temperament or risk disqualification. Buying from reputable and experienced breeders will help to ensure that you find a dog of quality temperament and good health. Avoid any animals that show extreme aggression or timidness. The Australian Cattle Dog, or Queensland Heeler, is an athletic dog that was bred specifically as a working animal. His temperament is that of a worker and these dogs tend to have a get-up and go attitude. Rarely do you find a Blue Heeler that’s content to laze around all day; if anything, you’re more likely to find one that will keep you on the go, trying to keep up with him. Because Australian Cattle Dogs are so athletic and highly intelligent, failing to meet their exercise needs can result in hyperactivity and destructive behavior. Resorting to anything from worrying the cat to destroying furniture, a bored Cattle Dog is not something many want to encounter. For this reason, it’s recommended that your Australian Cattle Dog have access to a large fenced-in yard or frequent trips to the local dog park. Daily walks are seldom enough for these canine athletes, so be forewarned, should you be interested in such a breed. With a medium-length coat, the Australian Cattle Dog requires a weekly or bi-weekly brushing in order to remove any dead hairs or dander from his skin, but maintenance of these beautiful dogs is minimal. Provided they are fed a quality food and plenty of fresh water, the Queensland Heeler is a relatively low shedder and will usually do quite well with a monthly bath. A good healthy Heeler’s coat will shine and require very little upkeep! Regular checks of the Heeler’s ears should be made, ensuring there is no buildup of excess wax, foul-smelling discharge, or redness present. Care should be made when cleaning the ears never to put anything down into the ear canal. A soft Q-tip may be used to clean dirt from the outer parts of the ear but care should be taken as many dogs dislike this tickling sensation. The Australian Cattle Dog is a highly intelligent dog, but can also be a very stubborn individual. Training these dogs can either be very easy or a definite difficulty, depending on your individual canine companion and your personal training methods. Persistence and patience are two words to keep in mind, when training a Queensland Blue Heeler. Obedience courses work very well with these dogs and individuals who do not have the opportunity to live in a ‘working’ environment, like they were bred for, usually benefit from classes that will challenge them. When dealing with an Australian Cattle Dog, bear in mind that they can be somewhat timid and care should be taken never to strike or yell at your dog – doing so will only make him more uncooperative. Routine and positive reinforcement will work best when training these unique dogs. The Australian Cattle Dog is a relatively healthy and long-lived breed. With an average life expectancy of 12 to 15 years, with many dogs living well beyond that age, the longest-lived dog (as recorded in the Guinness Book of World Records) is an Australian Cattle Dog who reportedly lived to the ripe old age of 29 (in human years)! 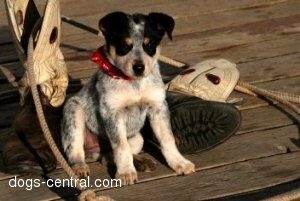 Is an Australian Cattle Dog or Puppy the Right Choice For You? 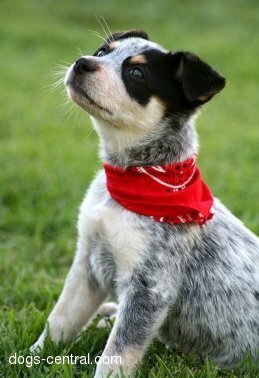 The Australian Cattle Dog is a wonderful canine and cannot be beaten when it comes to the job he was specifically bred to do. Capable of driving large herds of cattle over open terrain, they are quick, athletic and highly intelligent canines. This does not, however, mean that the Queensland Heeler is the perfect dog for everyone. Bred as a hardy working dog, the Australian Cattle Dog is ill-suited for apartment style living, nor does he take well to being a pampered house pet. He enjoys herding and being on the go – dogs who are deprived of this opportunity tend to show their frustrations by acting out in destructive manners and showing a strong tendency to be high strung and hyper active. If you’re considering a Blue Heeler for a pet, please realize that these unique dogs take a good amount of one-on-one time and attention in order to keep them happy. They require quite a bit of exercise and they have a tendency to be very wary or skittish around strangers. While they can make the perfect pet for the right person, careful thought should be given to whether or not the Australian Cattle Dog is the right breed for you.